When I was a kid, I cherished the Paula Danziger book Remember Me to Harold Square, in which a group of kids call themselves the Serendipities, named for the experience of making fortunate discoveries accidentally. 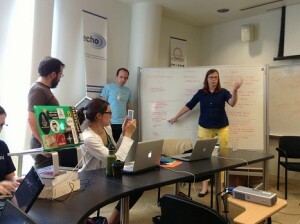 Last week I found myself remembering the book over and over again as I helped develop Serendip-o-matic, a tool which introduces serendipity to research, as part of a twelve person team attending One Week | One Tool at the Roy Rosenzweig Center for History and New Media at George Mason University (RRCHNM). In this blog post, I’ll take you through the development of the “serendipity machine”, from the convening of the team to the selection and development of the tool. The experience turned out to be an intense learning experience for me, so along the way, I will share some of my own fortunate discoveries. 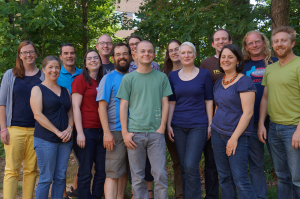 Approximately thirty people applied to be part of One Week | One Tool (OWOT), an Institute for Advanced Topics in the Digital Humanities, sponsored by the National Endowment for the Humanities. Twelve were selected and we arrive on Sunday, July 28, 2013 and convene in the Well, the watering hole at the Mason Inn. Tom Scheinfeldt (@foundhistory), the RRCHNM director-at-large who organized OWOT, delivers the pre-week pep talk and discusses how we will measure success. The development of the tool is important, but so is the learning experience for the twelve assembled scholars. It’s about the product, but also about the process. We are encouraged to learn from each other, to “hitch our wagon” to another smart person in the room and figure out something new. As for the product, the goal is to build something that is used. This means that defining and targeting the audience is essential. The tweeting began before we arrived, but typing starts in earnest at this meeting and the #owot hashtag is populated with our own perspectives and feedback from the outside. Feedback, as it turns out, will be the priority for Day 1. Mentors from RRCHNM take the morning to explain some of the basic tenets of what we’re about to do. Sharon Leon talks about the importance of defining the project: “A project without an end is not a project.” Fortunately, the one week timeline solves this problem for us initially, but there’s the question of what happens after this week? All of the advice seems spot-on and I find myself nodding my head. But we have no tool yet, and so how to apply specifics is still really hazy. The tool is the piece of the puzzle that we need. We start with an open brainstorming session, which results in a filled whiteboard of words and concepts. We debate audience, we debate feasibility, we debate openness. Debate about openness brings us back to the conversation about audience – for whom are we being open? There’s lot of conversation but at the end, we essentially have just a word cloud associated with projects in our heads. our audience for each tool is really similar; as a team we are targeting “researchers”, though there seems to be some debate on how inclusive that term is. Are we including students in general? Teachers? What designates “research”? It seems to depend on the proposed tool. the problem or need is often hard to articulate. “It would be cool” is not going to cut it with this crowd, but there are some cases where we’re struggling to define why we want to do something. Clarifying Ideas. Photo by Mia Ridge. A few group members begin taking the rows and creating usable descriptions and titles for the projects in a Google Doc, as we want to restrict public viewing while still sharing within the group. We discuss several platforms for sharing our list with the world, and land on IdeaScale. We want voters to be able to vote AND comment on ideas, and IdeaScale seems to fit the bill. We adjourn from the Center and head back to the hotel with one thing left to do: articulate these ideas to the world using IdeaScale and get some feedback. The problem here, of course, is that everyone wants to make sure that their idea is communicated effectively and we need to agree on public descriptions for the projects. Finally, it seems like there’s a light at the end of the tunnel…until we hit another snag. IdeaScale requires a login to vote or comment and there’s understandable resistance around the table to that idea. For a moment, it feels like we’re back to square one, or at least square five. Team members begin researching alternatives but nothing is perfect, we’ve already finished dinner and need the votes by 10am tomorrow. So we stick with IdeaScale. And, not for the last time this week, I reflect on Sheila’s comment, “being willing to make concrete decisions is the only way you’re going to get through this week.” When new information, such as the login requirement, challenges the concrete decision you made, how do you decide whether or not to revisit the decision? How do you decide that with twelve people? I head to bed exhausted, wondering about how many votes we’re going to get, and worried about tomorrow: are we going to make a decision? We decide to keep our project a secret until our launch and we break for lunch before assigning teams. (Meanwhile, #owot hashtag follower Sherman Dorn decides to create an alternative list of ideas – One Week Better Tools – which provides some necessary laughs over the next couple of days). After lunch, it’s time to break out responsibilities. Mia Ridge steps up, though, and suggests that we first establish a shared understanding of the tool. She sketches on one of the whiteboards the image which would guide our development over the next few days. Mia Ridge leads discussion of application. Photo by Meghan Frazer. Tom leads the discussion of teams. He recommends three: a project management team, a design/dev team and an outreach team. The project managers should be selected first, and they can select the rest of the teams. The project management discussion is difficult; there’s an abundance of qualified people in the room. From my perspective, it makes sense to have the project managers be folks who can step in and pinch hit as things get hectic, but we also need our strongest technical folks on the dev team. In the end, Brian Croxall and I are selected to be the project management team. We decide to ask the remaining team members where they would like to be and see where our numbers end up. The numbers turn out great: 7 for design/dev and 3 for outreach, with two design/dev team members slated to help with outreach needs as necessary. The teams hit the ground running and begin prodding the components of the idea. The theme of the afternoon is determining the feasibility of this “serendipity engine” we’ve elected to build. 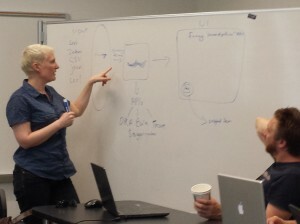 Mia Ridge, leader of the design/dev team, runs a quick skills audit and gets down to the business of selecting programming languages, frameworks and strategies for the week. They choose to work in Python with the Django framework. Isotope, a JQuery plugin I use in my own development, is selected to drive the results page. A private Github repository is set up under a code name. (Beyond Isotope, HTML and CSS, I’m a little out of my element here, so for more technical details, please visit the public repository’s wiki.) The outreach team lead, Jack Dougherty, brainstorms with his team on overall outreach needs and high priority tasks. The Google document from yesterday becomes a Google Drive folder, with shells for press releases, a contact list for marketing and work plans for both teams. This is the first point where I realize that I am going to have to adjust to a lack of hands on work. I do my best when I’m working a keyboard: making lists, solving problems with code, etc. As one of the project managers, my job is much less on the keyboard and much more about managing people and process. When the teams come back together to report out, there’s a lot of getting each side up to speed, and afterwards our mentors advise us that the meetings have to be shorter. We’re already at the end of day 2, though both teams would be working into the night on their work plans and Brian and need I still need to set the schedule for tomorrow. We’re past the point where we can have a lot of discussion, except for maybe about the name. @briancroxall: Prepare for more radio silence from #owot today as people put their heads down and write/code. @DoughertyJack: At #owot we considered 120 different names for our tool and FINALLY selected number 121 as the winner. Stay tuned for Friday launch! Wednesday is tough. We have to come up with a name, and all that exploration from yesterday needs to be a prototype by the end of the day. We are still hammering out the language we use in talking to each other and there’s some middle ground to be found on terminology. One example is the use of the word “standup” in our schedule. “Standup” means something very specific to developers familiar with the Agile development process whereas I just mean, “short update meeting.” Our approach to dealing with these issues is to identify the confusion and quickly agree on language we all understand. I spend most of the day with the outreach team. We have set a deadline for presenting names at lunchtime and are hoping the whole team can vote after lunch. This schedule turns out to be folly as the name takes most of the day and we have to adjust our meeting times accordingly. As project managers, Brian and I are canceling meetings (because folks are on a roll, we haven’t met a deadline, etc) whenever we can, but we have to balance this with keeping the whole team informed. Camping out in a living room type space in RRCHNM, spread out among couches and looking at a Google Doc being edited on a big-screen TV, the outreach team and various interested parties spend most of the day brainstorming names. We take breaks to work on the process press release and other essential tasks, but the name is the thing for the moment. We need a name to start working on branding and logos. Product press releases need to be completed, the dev team needs a named target and of course, swag must be ordered. It is in this process, however, that an Aha! moment occurs for me. We have been discussing names for a long time and folks are getting punchy. The dev team lead and our designer, Amy Papaelias, have joined the outreach team along with most of our CHNM mentors. I want to revisit something dev team member Eli Rose said earlier in the day. To paraphrase, Eli said that he liked the idea that the tool automated or mechanized the concept of surprise. So I repeat Eli’s concept to the group and it isn’t long after that that Mia says, “what about Serendip-o-matic?” The group awards the name with head nods and “I like that”s and after running it by developers and dealing with our reservations (eg, hyphens, really? ), history is made. As relieved as I am to finally have a name, the bigger takeaway for me here is in the role of the manager. I am not responsible for the inspiration for the name or the name itself, but instead repeating the concept to the right combination of people at a time when the team was stuck. The project managers can create an opportunity for the brilliant folks on the team to make connections. This thought serves as a consolation to me as I continue to struggle without concrete tasks. Meanwhile, on the other side the building, the rest of dev team is pushing to finish code. We see a working prototype at the end of the day, and folks are feeling good, but its been a long day. So we go to dinner as a team, and leave the work behind for a couple of hours, though Amy is furiously sketching at various moments throughout the meal as she tries to develop a look and feel for this newly named thing. On the way home from dinner, I think, “there’s only two days left.” All of the sudden it feels like we haven’t gotten anywhere. The decision to add the Flickr API to our work in order to access the Flickr Commons is made with the dev team, based on the feeling that we have enough time and the images located there enhance our search results and expand our coverage of subject areas and geographic locations. We also spend today addressing issues. The work of both teams overlaps in some key areas. In the afternoon, Brian and I realize that we have mishandled some of the communication regarding language on the front page and both teams are working on the text. We scramble to unify the approaches and make sure that efforts are not wasted. This is another learning moment for me. I keep flashing on Sheila’s words from Monday, and worry that our concrete decision making process is suffering from”too many cooks in the kitchen.” Everyone on this team has a stake in the success of this project and we have lots of smart people with valid opinions. But everyone can’t vote on everything and we are spending too much time getting consensus now, with a mere twenty-four hours to go. As a project manager, part of my job is to start streamlining and making executive decisions, but I am struggling with how to do that. As we prepare to leave the center at 6pm, things are feeling disconnected. This day has flown by. Both teams are overwhelmed by what has to get done before tomorrow and despite hard work throughout the day, we’re trying to get a dev server and production server up and running. As we regroup at the Inn, the dev team heads upstairs to a quiet space to work and eat and the outreach team sets up in the lobby. The outreach team continues to work on documentation, and release strategy and Brian and I continue to step in where we can. Everyone is working until midnight or later, but feeling much better about our status then we did at 6pm. @raypalin: If I were to wait one minute, I could say launch is today. Herculean effort in final push by my #owot colleagues. Outstanding, inspiring. The final tasks are upon us. Scott Williams moves on from his development responsibilities to facilitate user testing, which was forced to slide from Thursday due to our server problems. Amanda Visconti works to get the interactive results screen finalized. Ray Palin hones our list of press contacts and works with Amy to get the swag design in place. Amrys Williams collaborates with the outreach team and then Sheila to publish the product press release. Both the dev and outreach teams triage and fix and tweak and defer issues as we move towards our 1pm “code chill”, a point which we’re hoping to have the code in a fairly stable state. We are still making too many decisions with too many people, and I find myself weighing not only the options but how attached people are to either option. Several choices are made because they reflect the path of least resistance. The time to argue is through and I trust the team’s opinions even when I don’t agree. We end up running a little behind and the code freeze scheduled for 2pm slides to 2:15. But at this point we know: we’re going live at 3:15pm. Jack Dougherty has arranged a Google hangout with Dan Cohen of the Digital Public Library of America and Brett Bobley and Jen Serventi of the NEH Office of Digital Humanities, which the project managers co-host. We broadcast the conversation live via the One Week | One Tool website. The code goes live and the broadcast starts but my jitters do not subside…until I hear my teammates cheering in the hangout. Serendip-o-matic is live. At 8am on Day 6, Serendip-o-matic had its first pull request and later in the day, a fourth API – Trove of Australia – was integrated. As I drafted this blog post on Day 7, I received email after email generated by the active issue queue and the tweet stream at #owot is still being populated. On Day 9, the developers continue to fix issues and we are all thinking about long term strategy. We are brainstorming ways to share our experience and help other teams achieve similar results. I found One Week | One Tool incredibly challenging and therefore a highly rewarding experience. My major challenge lay in shifting my mindset from that of a someone hammering on a keyboard in a one-person shop to a that of a project manager for a twelve-person team. I write for this blog because I like to build things and share how I built them, but I have never experienced the building from this angle before. The tight timeline ensured that we would not have time to go back and agonize over decisions, so it was a bit like living in a project management accelerator. We had to recognize issues, fix them and move on quickly, so as not to derail the project. However, even in those times when I became acutely more aware of the clock, I never doubted that we would make it. The entire team is so talented; I never lost my faith that a product would emerge. And, it’s an application that I will use, for inspiration and for making fortunate discoveries. The #OWOT team. Photo by Sharon Leon. Next Next post: Digital Content: Who May Publish? Who May Sell? Who May Access?